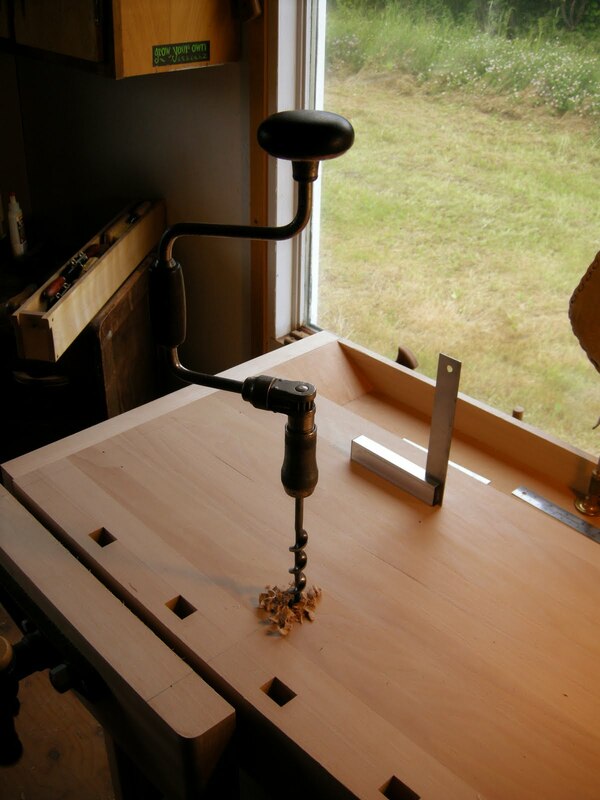 Drilling holes in a perfectly fine bench top can be as scary as you make it; I’ve been using this style bench at my shop in Toronto and have come to find I’m much more comfortable hand planing stock with it sitting freely on the bench top surface butted up against a thin baton of hardwood. 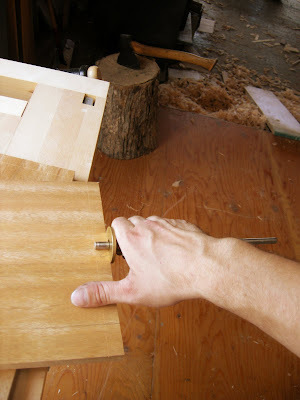 No tail vise or hold-fasts just the weight and the balance of my arms and the hand plane working together. 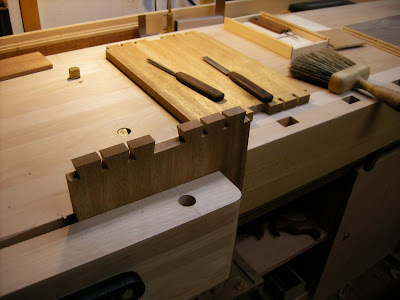 (There are of course exceptions with this rule like cross grain work with a scrub plane) This, my summer bench has never been equipped with dog holes so now, before I get any further along with this dovetailed box project I’ll need to get out the brace and bit and make some cheese. In the shot above you can see where I placed my bench dog holes; this is my comfort zone and it’s what works for me. I’d suggest clamping a baton across your bench top and see where’s right for you. 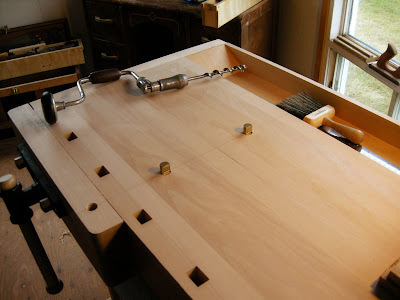 Maybe clamping a baton across the bench will always be enough for you and you’ll never have to scar your work bench…in my world I don’t mind a few holes in the work surface. I’m using a couple of Bench Pups from Veritas; they’re the round brass type 2 3/8″ long. I also use a pair of the 4 3/8″ ones but they’re still sitting all snug in the holes on my bench top back in the city. With the third hole drilled I’m ready to get back to work and surfacing the four pieces of the project is next on the list. 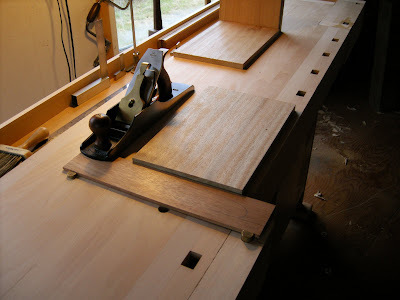 As mentioned I’ll lay a thin baton of hardwood across the bench top and work the boards flat, checking as I go. My shop made winding sticks also made the journey home and they’re the perfect tool for the job of checking this Khaya for any humps, valleys or wind. Four pieces, square and smooth I’ll sit them on the bench top and take a few steps back. I’m already thinking about adding to the design, perhaps a small frame to hold the carcass? There’s still some long skinny strips of Khaya and will think more of the piece while I’m marking out the dovetails. The Tite-Mark again finds its way into my hand- this time the perfect application. 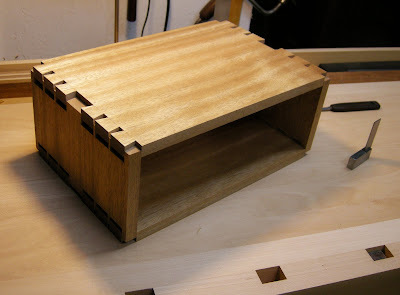 I’m laying out simple through dovetails, nothing too fancy, I am still on vacation over here! I like to clamp both pieces together when I lay out my tails as seen in the next photo below…This will obviously insure continuity between the top and the bottom and will speed up the process a little as well. 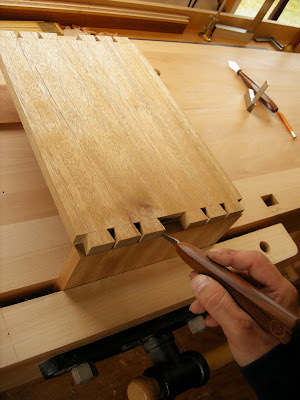 I walk the dividers across the tail board and draw in the lines with a pencil and my dovetail marker. You’ll notice that I divide the board into seven even sections and then when I start sawing I’ll skip the middle one. This is something I’ve been doing lately, (perhaps a nod to my Krenov admiration?) I love the look the two trios of tails make. 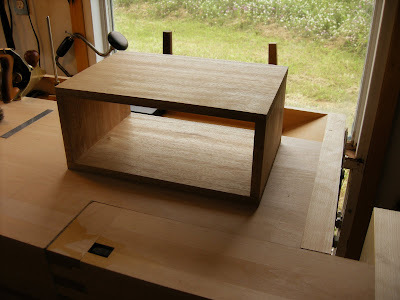 (my tool chest and small wall cabinet I made for my book projects also had this same treatment) With that it’s time to cut dovetails and my small rip saw seems to really like this hardwood. 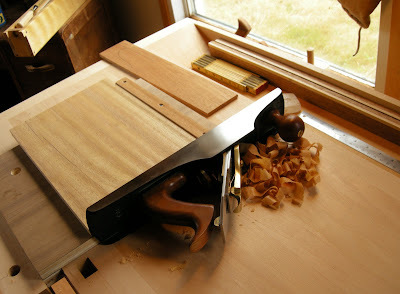 Khaya is a great wood for hand tool work except sometimes when hand planing. The ribbons in the wood grain can reverse and bend which in turn can result in tear-out. This is easily remedied by some sanding in the final stages but I’m hoping to avoid it if I can. The tails are cut first in my world but you can start with the pins if you’re so inclined. 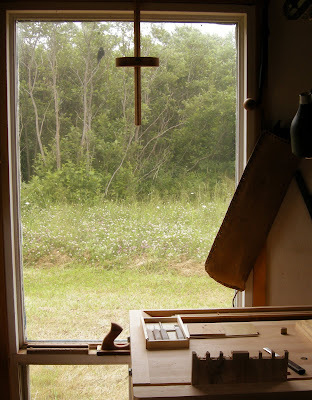 From dovetail saw to fret saw I wander and in no time at all I’m reaching for some chisels to clean out the waste. My detail chisels which I can’t say enough about are always close by. 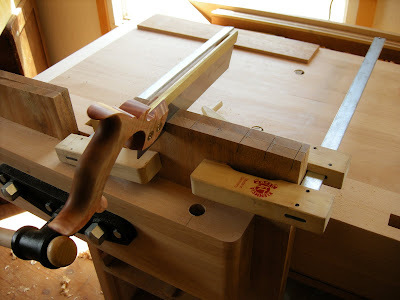 Again from the dovetail saw to fret saw dance I’m back to the chiseling and ready for a dry fit. 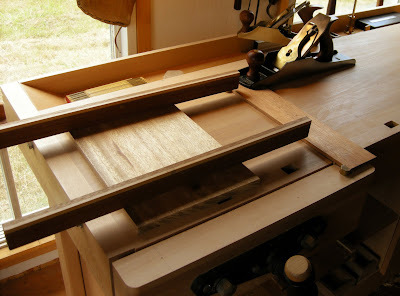 At this point the box is ready for glue; I’ve been thinking about the long strips of Khaya left in the off cut pile. Maybe a frame assembly to cradle the box? A trestle type affair dictated by the stock in question. In my work space I’m able to create and design without any guidelines or rules save the lumber I’ve chosen (perhaps foolishly) to work with. Sometimes the pencil and paper are better left on the shelf and we can meander through this creative process with only the wood to guide us. It can be quite liberating stumbling through a building process when time is our only real investment. I’ve been enjoying myself over these past two days and really most of my time was given to setting up the work space. The hardwood owes me nothing but I’m going to do my best to lure it into some form I can call my own. A cantilevered box over a thin double trestle? This evening I’ll do some more measuring and continue a little further on, down the path. I just wanted to say that I'm really enjoying your blog. I'm a beginning hand tool worker and I've gotten some really useful information here. I also share your affection for Dave Mallett's music and lyrics. Once again I find you and I thinking in parallel! 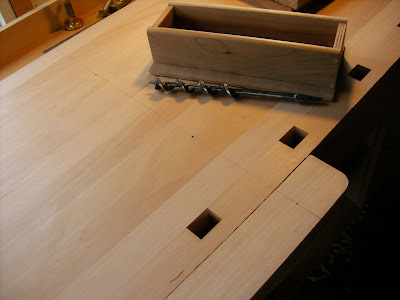 I recently held my breath and drilled holes in my bench top for the Vertitas Bench pups. It has worked out well. 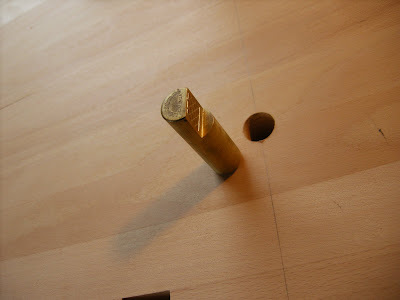 I also have their Bench Anchors which fit in the same holes, and, with use of a drilled board, effectively as act stops with an extended reach. 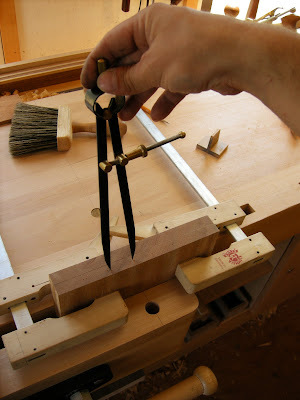 Also, a bit more elaborately, there's a method for stabilizing wide boards in the front vise. See what you think. They work for me. Again, excellent information and presentation on your blog. Thanks. Looking forward to your book! Thank you for the detail posts. 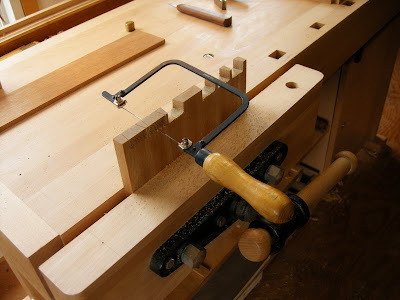 I am working more and more with handtools and enjoy reading the process and tools that you use to build your projects.